Hi. Thanks for looking at my advert. 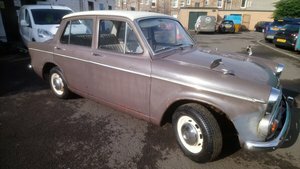 I am selling my 1962 Hillman Minx Series IIIC de Lux. Very nice tidy condition. Solid, original, reliable, useful and comfortable. 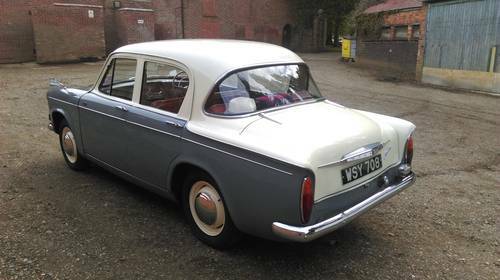 Bought as a fun classic car to enjoy during summer and culminating in a special trip to the Goodwood Revival in September. 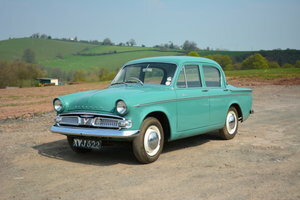 Now is time to pass "Hilda" on to her next owner as I concentrate on my other classic cars. 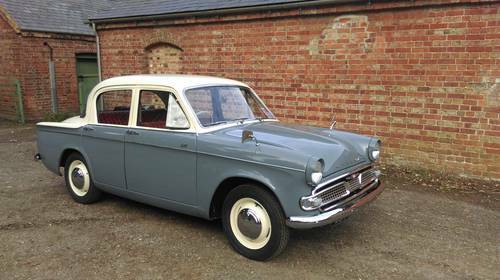 The Audax design (Latin: Bold) period Minx are a mark of Rootes Group's arrival into the swinging 60s. 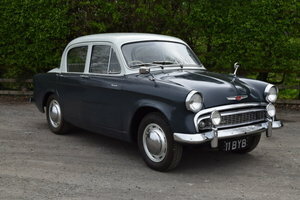 The Raymond Loewy Organisation styled the Series III cars adopting USA influenced cues of wrap-around chrome grille and tail fins. Painted in two-tone thistle grey with light ivory roof and boot, this 1962 Minx wears her 53 years with pride and dignity. 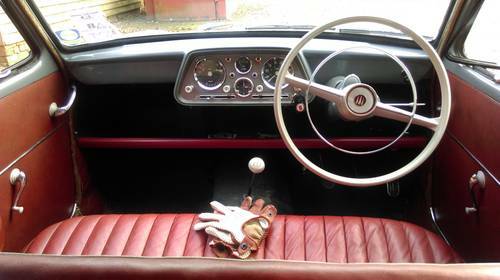 Interior is very original with red upholstered bench seats and original rubber floor coverings. Everything works as it should. Low levels of wear/patina are commensurate with age and avoid that garish "everything just restored" look. The car has covered just over 72,000 miles including me adding some 1,700 trouble free miles this summer. MoT runs to February 2016. She has been repainted at some time prior to my ownership. This has been done well with good smooth paint coverage and gloss finish. The body panels of this car are therefore very presentable. Underneath she is structurally very sound. I have only found two small areas of welding repair, both of these look as if done some time ago. The entire underside is protected with well applied coverings of quality underbody waxes ensuring water-resistant protection. 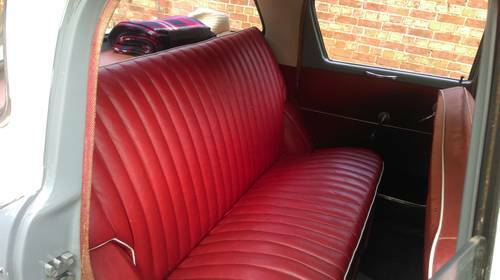 Interior is clean and tidy with classic bench seats front and rear. Remarkably comfortable even on extended journeys. The main seating areas are free from splits or tears with all stitching in good order. A set of front (inertia reel) and rear (static) seatbelts with sympathetic chrome lift-flap buckles were fitted by me for greater peace of mind on the safety front. All the interior trim otherwise appears to be original including the factory rubber floor mats which are in excellent condition. The transmission tunnel carpet shows some wear and tear but is not torn. Parts of the cloth covered door aperture edge trims have worn away and been partly repaired. Rear door trim cards have been repaired at the bottom, possibly due to being scuffed by people's feet getting in/out. Headlining as all complete, taught and free from sags. Not quite as white as it would have been new, but presentable never-the-less. Luggage boot is clean and tidy with spare wheel (brand new tyre), jack, wheel-brace and starter handle. No floor mat is fitted but I believe this was a simple plywood board with rubber covering, easily remade. Mechanically strong and reliable, she has been a pleasure to drive, competently mixing with modern traffic flows. The engine is smooth and quiet, starting first time with a dab of choke. Whilst driving she purrs along happily at any speeds asked of her. Importantly she is comfortable at continuous cruise of 65-70 mph meaning you can easily handle a long motorway drive (eg to Goodwood) without being caught up amongst the lorries. The 4-speed, floor shifter, gearbox has synchromesh on all but 1st gear and willingly shifts up and down aided by a smooth and progressive clutch action. The "crash" first is also a straight cut cog and makes a delightfully period sound as one pulls away from a standstill, otherwise 1st is barely required. The braking system was subject to a full overhaul by the owner previous to me. The all-round drum brakes require a firm push on the pedal but are confident and pull the car up straight and without drama. Handbrake (mounted to the right due to bench seat) is easy to operate and secure on any hill. 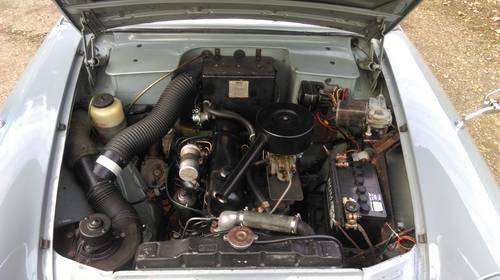 Easy going steering action and excellent turning circle make the Hillman simple to park. On the move a steering "box" is never the most precise tool but the linkages are free from play and the helm is adequately responsive even for enthusiastic driving within the scope of the chassis. Excellent new tyres - 155x15 Vredestein Sprint Classics transformed the road holding from the nasty Nexen items of the incorrect size which were fitted when I got her! These tyres are aimed directly at the classic car market giving very good levels of tyre performance with a sensible period appearance. The exhaust system is past its best with crack in the silencer box. This has been fixed with a good old-school repair bandage for the time being and is bearing up well over many miles. 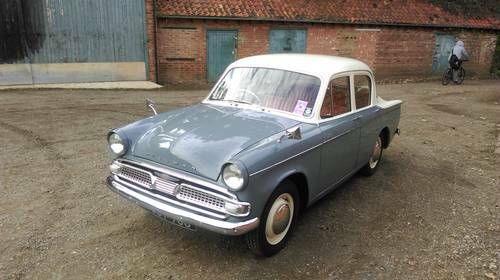 So, all in all a very dependable classic which can be put to pleasurable use straight away without further work or restoration required. Some further refinement to the cosmetic appearance under the bonnet would be an easy way to further enhance the visual appeal. 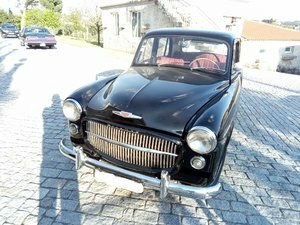 This Minx has an interesting history folder of various MoTs and bills, some dating back to the 70s but mostly from the 90s, give good verification of the mileage and also an interesting price point when she changed hands in 1991! Paint: polish to clean and surface the paint followed by durable Simoniz Carnuba Wax finish. Interior: full clean of all surfaces and windows. Installation of front and rear seat belts. Tyres: 5 new Vredestein Sprint 155x15, new valves and wheels balanced. Underbonnet: clean up and Dinitrol ML wax body seams. Service: Full bumper to bumper major service and lubrication attending to every item on the Rootes Service sheet. Includes all engine and transmission oils, new coolant, suspension greasing points and all checks and adjustments. Electrical security isolator fitted to (-) battery connector. I would welcome you to call me discuss any questions you may have and come to view and test drive (subject to insurance cover) or a demonstration drive. If you are unable to view and wish to buy from afar, I'm happy to send you more photos of any aspects you wish by e-mail, or to host any friend of yours to come and view. I looking for very close to £4,000 so as to partially cover off the investment I have made in improving this already good vehicle over the price I paid. Of course I am open to hearing your sensible offers.